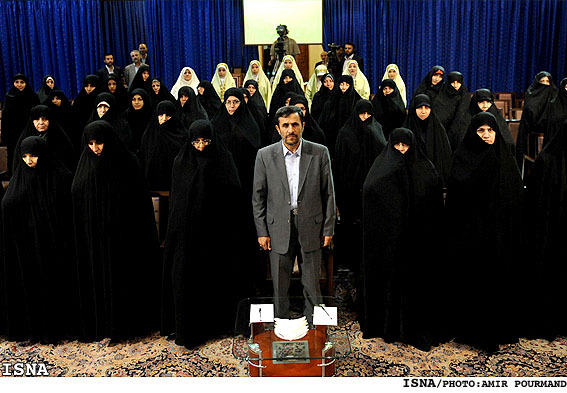 Mahmoud Ahmadinejad was the keynote speaker at the Women and Islamic Awakening Conference held in Tehran. This two-day tour de force for the femme fatales of Muslim activism featured workshops that strictly reinforced the crucial role these dames play in maintaining the hegemony of jumped-up jerks like the one featured in the photo below. Mahmoud and His Body Bag Harem. Awakening conference. More like a nightmare from hell. A commenter at Gateway Pundit had a couple of great new workshop suggestions to help round out the whole Islamist experience for these damned damsels. What do you think of these ideas? 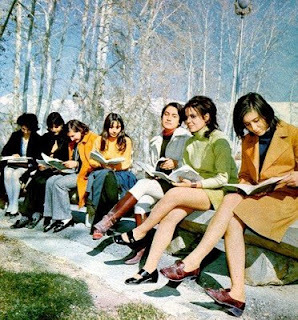 And just to provide a little reality check here as to the direction Muslim cultures are driving their women, here are two shots of young college students from the 1970s right before Iran’s Islamic ‘revolution’. Then and Now—Women on the Move, but unfortunately, not headed in the direction of Modernity. 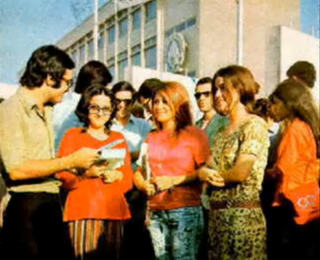 This entry was posted in Political/Social and tagged Gateway Pundit, Iran, Iranian women, Islam, Mahmoud Ahmadinejad, modernity, Mohammed, muslim, Women and Islamic Awakening Conference. Bookmark the permalink. I don’t remember if I ever sent you this article, but worth the read in light of this post! Yes it is, and it also changed the way I thought about burquas. I have always said that I feel so fortunate I was born a female in this country! Sharia law and all it’s scourge on our way of life cannot be tolerated, ever! It is indeed the real war on women, Mary. I truly had no idea that this had transpired in my lifetime. I had always assumed the clothing was some ancient tradition. Unfortunately, Kristy, the only ancient tradition that this culture is ‘celebrating’ is misogyny. These women have no choice. Wow that is all I can say. That is such a sad, stark, horrific contrast. I showed this post to a co-worker last night and said this is the REAL war on women. And you are so right, Mary. The first thing that struck me was all the happy faces in the top picture. I guess if they smile too often that would be seen as flirting–ten lashes or perhaps they just get stoned to death.